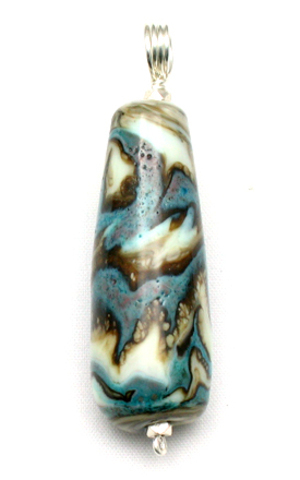 This tapered cylindrical lampworked bead is a complex combination of striated grey "fossil", copper green, and ivory glass with accents of pure silver foil. The molten glass was manipulated with a pick and shaping paddle to produce the patterning. The copper green glass provides a rich accent in a field of soft color ranging from ivory to dark brown. It is designed to be worn as a pendant on the black satin cord which comes with it or it can be strung on a favorite chain. The bead has a sterling silver wire bale that is approximately 3/16" in diameter ... large enough for most omega and similar chains.